WASHINGTON (Nov. 21, 2012) -- The Army team took the top slot, beating out the Veterans Affairs team in the final round of the Department of Defense Warrior Care Month sitting volleyball competition, Nov. 20, at the Pentagon Athletic Center. "It means everything," said Sgt. Monica Southhall, an Army team participant. "You come out here today and show that regardless of your disability, you are still able to do something fun." 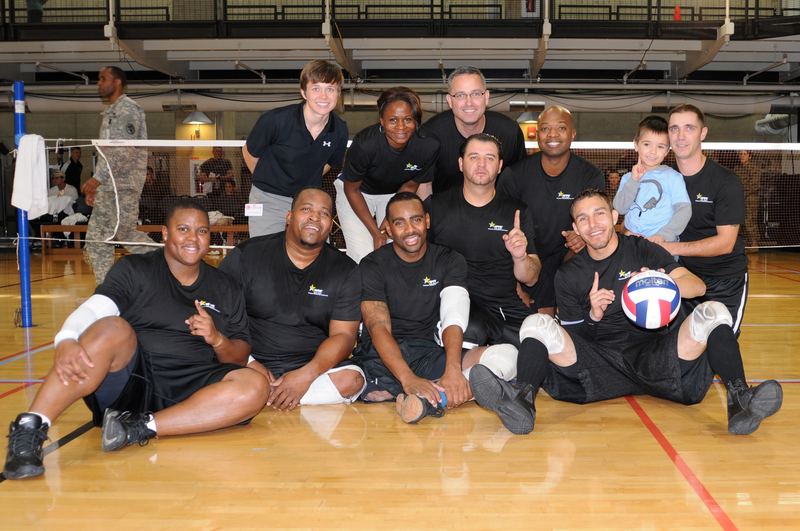 The Army team took the top slot, beating out the Veterans Affairs team in the final round of the Department of Defense Warrior Care Month sitting volleyball competition, Nov. 20, 2012, at the Pentagon Athletic Center. Army finished the tournament 8-0. VA came in second, Special Operations Command took third, and the Marines, the Air Force and the Navy took fourth, fifth and sixth place, respectively. Southhall is still in the Army and is assigned to the Community-Based Warrior Transition Unit at Virginia Beach, Va. A wounded warrior, she tore both rotator cuffs and injured her left knee while serving in Afghanistan. She is both a track and field athlete and a sitting volleyball player. As part of the Army's team at the Warrior Games in 2012, she helped her team take the gold. Right now, she said, she thinks the goal for the team at next year's games is pretty much the same as it was last year and the same as it was at the Pentagon competition: to dominate the playing field. "Last year at the 2012 Warrior Games we took the gold medal -- that's pretty much our same goal," she said. "We're looking to repeat in the 2013 Warrior Games. We get together, we do camps at different times, to try to keep our momentum going and keep our skills up. I think we can repeat again next year." 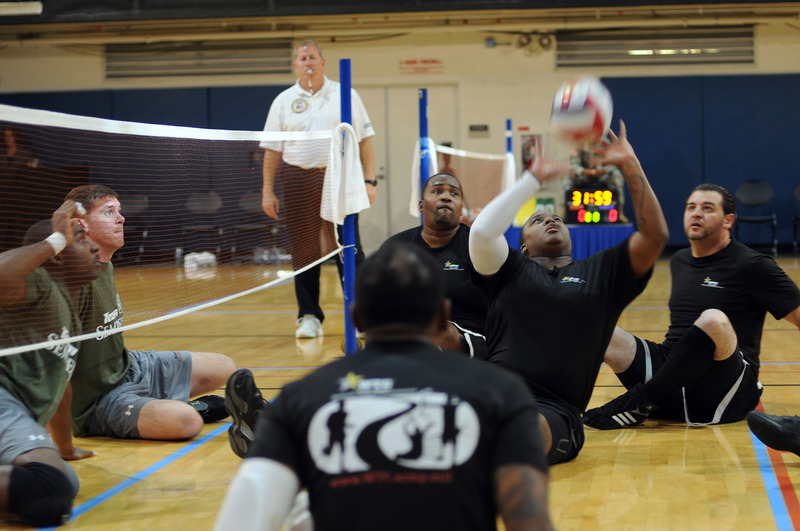 Robbie Gaupp, a veteran of the Army and the gold-winning 2012 Warrior Games sitting volleyball team, also helped the Army take the No. 1 slot in the Warrior Care Month tournament. He said winning is all about training. Even though the Army's team won gold, he said, "you still have to train hard, you have to practice. No matter, when you take a break for a day, or time off, you start losing basics. You want to go back to basics and fundamentals which create great athletes." Winning gold at the Warrior Games and taking the top slot at the Warrior Care Month competition means a lot to Gaupp, he said. "It's great to come out and show ... warriors don't have to give up, even though you are injured," he said. Gaupp initially joined the Army in 2003, but was medically retired as a sergeant in 2010, due to shoulder injuries sustained during Operation Jumpstart, along the Texas-Mexico border. The competition at the Pentagon was in recognition of the DOD's Warrior Care Month, said Master Sgt. Jarrett Jongema, the noncommissioned officer in charge of the Army Adaptive Sports and Reconditioning Branch. The Army hosted the event this year, and Jongema, a wounded warrior himself, said "we wanted to showcase recovery, we wanted to showcase resiliency, and at the same time we bring about awareness of some of the different sports." This is the second year the event was held in the Pentagon, but Jongema said this year was better than last, because this year, all four services sent a team of skilled players to compete. "That changes the dynamic," he said. "The competition level goes through the roof." This year, the VA team, "Team Semper Fi," was sponsored by the Semper Fi Fund. Jongema said he sees no reason why more sponsored teams couldn't play in next year's event. "Why wouldn't you expect to see other sponsored teams show up ... other great programs and non-profits?" he said. "I want to see it grow. This was very successful today."